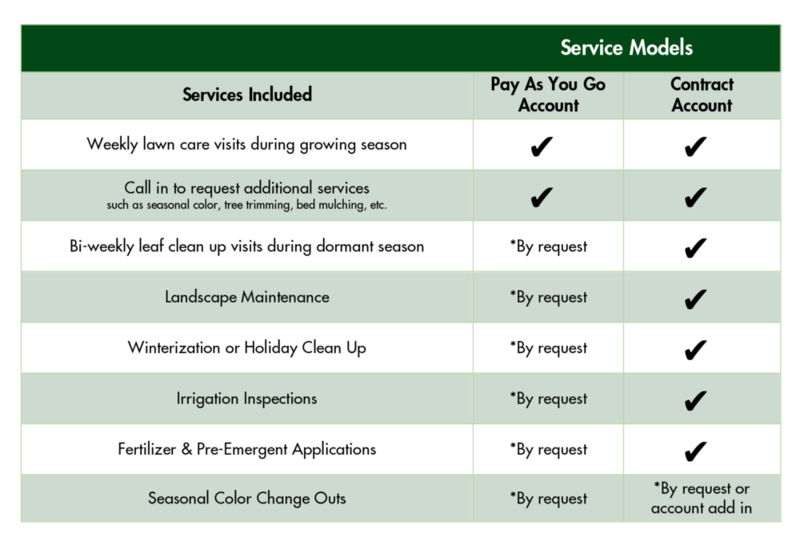 Clearfork Lawn Care is pleased to offer two account service models: Contract and Pay-As-You-Go. There are some important distinguishing service features and functionality for each account type. Below, you will find the details on which services are included in each model. Contract accounts are billed monthly at a formulated set rate of an all-encompassing service for a 12-month term. This account is ideal for the customer who doesn’t want to worry about any work that needs to be done to their lawn, as this account is year round with pre-scheduled visits and jobs at no request. Pay-As-You-Go accounts are billed monthly at a price-per-visit rate for weekly lawn care visits with no term. This account is ideal for the customer who may maintain parts of their landscape themselves or who prefer to request when and what type of service they’d like performed each month in addition to their weekly lawn care. Click below to view our full Service Schedule Calendar to see the services offered, when they’re performed, and recommended per account type.